The traditional drivers of growth are no longer enough. That's why top-performing companies are working with their own customers to find new ways to grow. Firms will need to co-create new sources of revenue by understanding, leveraging, aligning, and executing together with customers and partners along their value chain. 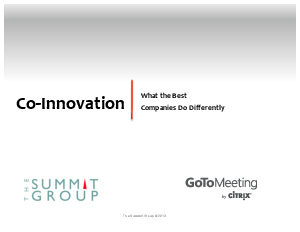 This Summit Group brief explores what leading companies are doing differently to build profitable relationships, counter commoditization and accelerate growth.